Who says that baby food has to be bland? Why not make meal time a culinary adventure for babies too? Personally, I believe that tempting your little foodie’s taste buds from an early age encourages adventurous palates, which in turn nurtures adventurous eaters. Spices add variety, expose babies to a range of different flavours, and also give them a head start on becoming used to the flavours of family meals. There are so many “dos and don’ts” when it comes to how and when to feed your baby spices and herbs. While I agree that you should limit certain foods due to possible allergic reactions, I also think that you shouldn’t deprive your baby’s developing taste buds of harmless spices and herbs. I began introducing spices and herbs into my son’s meals at around seven months. I incorporated them individually into meals, following the three-day rule, then began combining flavours to create a variety of interesting spice blends. 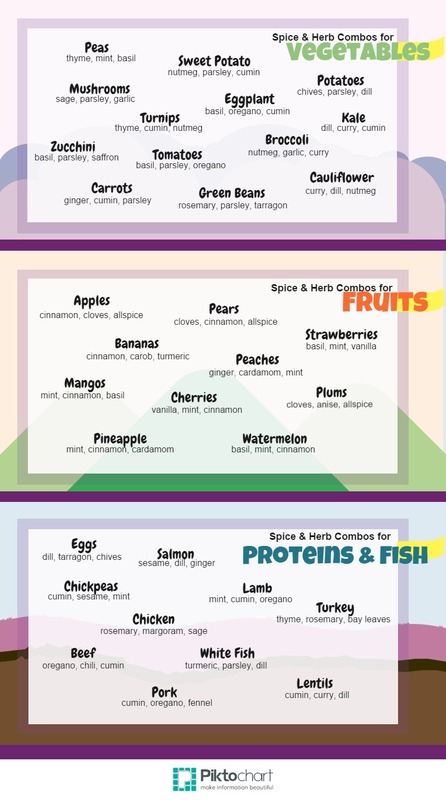 Above is a chart with common first foods and spices and herbs that enhance their flavour. Remember that combinations can always be based on personal preference (these are my personal faves!). Store dried herbs in a cool, dry place away from sunlight in an airtight container or sealed in a plastic bag. Dried herbs are best used within a year. As herbs lose their color, they also lose flavor. Rinse and pat dry fresh herbs, wrap in a dry paper towel, and store in the fridge in a resealable bag. Herbs retain more flavour if you store the leaves whole and then chop or crush when ready to use. Some fresh herbs freeze very well, such as dill, parsley, rosemary, thyme, bay leaves, and chives.